Today’s Geospatial Analyst has a large array of tools and technologies available to rapidly and efficiently access, prepare and exploit remote sensed information. However, these available capabilities are unable to keep up with demand – the large volumes of available information and the ever increasing demands for extracted information are far outstripping the capabilities of the conventional analyst, resulting in a different approach is needed to increase analytical efficiency and accuracy. The key to a new level of geospatial exploitation accuracy and efficiency is through a holistic approach that leverages the capabilities available across the entire geospatial domain. Modern information infrastructures make it possible to access data from across different sensor modalities, retrieve historical data from geodatabases and leverage existing knowledge of the area under observation. It is through this data fusion environment that new levels of accuracy, timeliness and automation are possible; however current tool and data offerings are still focused on specific domains, trying to eek out incremental gains while analyst struggle with overwhelming information demands. Tools must break out of modality-bounded silos to deliver a unified, fully integrated exploitation ecosystem that enables rapid and accurate information extraction. A majority of today’s application tool sets and data offerings all focus on a single sensor modality – imagery tools for imagery, LiDAR tools for LiDAR datasets, Radar tools for SAR data. The state of the market isn’t surprising, given that these fields evolved around the methods used to capture data. The sensor developers needed tools to prepare and exploit collected data. As the technology and sensor capabilities advanced, so did the tools available to each modality. Higher accuracy and greater information extraction was possible at a steady rate, meeting the information needs of the organization. 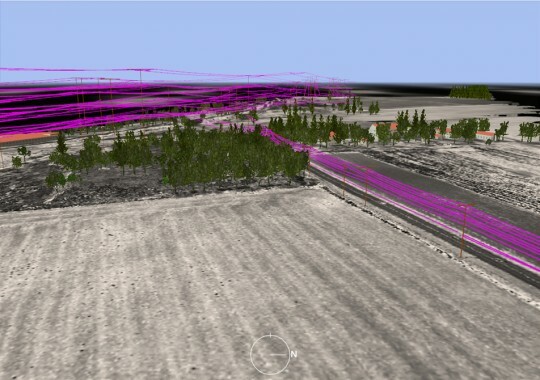 Users of LIDAR analysis software programs can identify and extract power lines from 3-D data for accurate utility management and right-of-way studies. Historically, while the capabilities and derived products from each modality have moved forward at a steady rate, the use of multi-modality data sources in a exploitation process was rare, and often confined to experimental activities. The data, tools and expertise were segmented along modalities. Segmented operational tasking prevented collection over a common area with multi-modality sensors difficult to coordinate. The only use of multi-modality information might occur at the decision makers’ level, based on derived information products, well past the exploitation phase of information extraction. Today landscape is changing. Decision makers are realizing the limitations of each sensor type and the value of combining modalities into a single operational environment. Additionally technology has evolved to enable the deployment of multi-modality sensor packages that are able to perform coordinated sensor collects. Policy, need and technical capability are converging to support multi-modality data collection. As with all technologies, the evolution of sensor packages have made it possible to support the deployment, tasking and collection of multiple modalities in a single sensor package. Space and power requirements continue to shirk though advances in miniaturization. Increased storage capabilities and efficient communication protocols have enabled rapid data access. Combined with modern deployment models, such as unmanned aircraft operations, and the availability of multiple-modality, common collect datasets is becoming a reality for the geospatial analyst. Besides increased data availability through the deployment of multi-modality sensor platforms, information technology is also breaking down the data access barriers. Increases in data storage solutions, network access and associated standards are enabling rapid data discovery and access. Instead of browsing through data listings and queries, users can interactively connect, and browse available libraries. Standards-based protocols enable ad-hoc discovery and access to information to support the multi-modality analyst. Alert systems notify the user of data availability and the latest feedback based systems even allow users to make requests for future collections. Merge data availability with access to the large historical archives such as the Landsat archive and the once isolated geospatial analysts is now able to rapidly access all the data inputs they required. With the barriers to multi-modality data access falling, the geospatial analyst can start leveraging the strengths of each sensor’s capabilities to deliver superior products in shorter operational timelines. With wide variety of common collection data sets, the strengths of each individual sensor modality can be combined together to deliver a feature rich, virtual sensor which enables new possibilities for exploitation and information product availability and accuracy. While the range of possibilities is endless for a multi-modality data set exploitation, the following examples illustrate the power of this type of exploitation environment. LiDAR-based feature extraction is a resource intensive undertaking. One method to reduce processing overhead is to use multi-spectral classification techniques to broadly classify the collection area. Using the results of this classification to identify key areas for LiDAR feature extraction, and focus processing on these classes. LIDAR data were incorporate with a multispectral image to help with building extraction in an area where building and ground-surface materials have similar composition. For littoral bathymetric hyper-spectral collects, water column correction is key for the observation and image exploitation. Co-collected LiDAR data provides accurate depth measurements to improve data-calibration and increase overall exploitation abilities. A modern technique for feature classification is to first identify features and then derive a set of feature attributes. Classification techniques identify unique values of these attributes to identify feature classes across the entire feature set. The addition of other data modality sets adds additional dimensions to the feature attribute set, delivering a higher fidelity to the classification process. As these examples show, the additional information provided from different modalities opens up an advanced levels data preparation and exploitation. Besides data availability and multi-modality exploitation patterns, software tools must support each sensor modality and present a common information model to deliver a common exploitation platform. An example of this type of multi-modality, or fusion environment exists today in the ENVI product platform from ITT Visual Information Solutions. ENVI delivers an exploitation and development platform that supports multiple modalities. Founded on imagery and imagery exploitation, ENVI also delivers full SAR support through it’s SARScape module and is also adding support for LiDAR display and exploitation. ENVI merges the unique capabilities of each modality into a common platform, enabling development and deployment of multi-modality exploitation functionality. The demands being placed on our current geospatial systems and the analysts that operate them are inhibiting the ability to reach the efficiency, accuracy and timeliness goals placed upon them. The single sensor focus of these systems and their associated operational protocols are stifling the capabilities of the analyst. A solution to this situation is leveraging a holistic approach to analysis – leveraging multi-modality data sources for exploitation and information derivation. Today’s sensing platforms are deploying multiple sensors, leveraging multiple modalities during a single collection operation. This data is also readily available to the analyst through use of modern information technology, which deploys common standards, formats and communication protocols to rapidly make information available throughout the geospatial enterprise. Combined with the latest software tools that support multi-modality exploitation and algorithm development, the struggles of today are eliminated and multi-modality exploitation becomes the standard operation scenario. We are on the verge of a new era of data exploitation capabilities that leverages all available information to derive highly accurate and timely results. 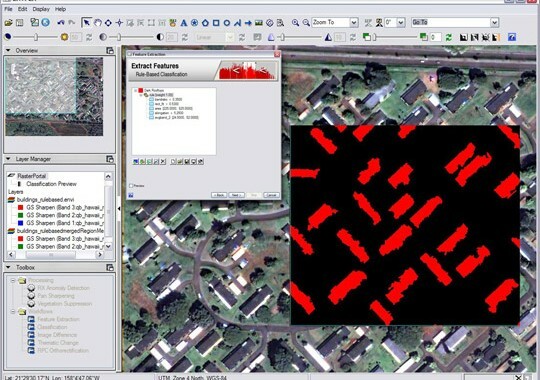 Through common data collects, deployment of common format and protocol standards and multi-modality exploitation environments, geospatial analysts are empowered to rapidly capture the entire context of an exploitation event and extract high-value information products that meet the requirements of the always connected, high-activity geospatial enterprise.